Located in a matured community mixed mslay and chinese. Walking distance to public amenities and shopping area. ...Before it's taken off from the market. Contact STANLY(Ipoh Oriental Realty) 0135206--- for further information. Thankyou and have a nice day! 6300 Sq. Ft. 4 bedrooms 4 bathrooms 👉 New renovated with plaster ceiling and pai. Great offer #BelowMarketValue FOR SALE Double Storeyuse. Bercham? 22x86 very spacious? Leasehold till 2086? Facing West? 4 Bedrooms? 3 Bathrooms. Langkap is located at Hilir Perak, along the Tapah-Teluk Intan route about 10km away from Bidor. Mea. SG. siput(u), PERAK 955 ac @ RM75K/ac totaling RM72M, matured oil palm estate yielding 23mt/ha, Leas. Timber treatment plant located with gerik indsutrial estate, perak with currency stil operation need. 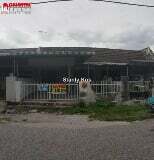 Strategic Locations at Kampar Putra 20' x 65' Rumah Teres 1 tingkat-4 Room. 6 unit Rm185,000-Rm188,000 20' x 70' Rumah Teres 1 tingkat-4/3 Room.